The world’s most famous flower show is back for another year, featuring cutting-edge garden design, fabulous shopping and plants from every corner of the globe. 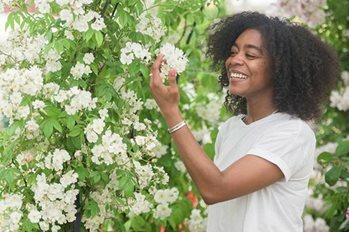 The RHS Chelsea Flower Show, sponsored by M&G Investments, runs from 21 to 25 May 2019 and will feature the very best that the gardening world has to offer, including the famous Great Pavilion at the heart of the show packed with specialist growers and nurseries. It’s the ultimate day out so make sure you get your tickets and read on to find out what’s happening in 2019. It wouldn’t be Chelsea without the super-sleek gardens from internationally-renowned designers and 2019 is no exception. Top designer Andy Sturgeon will create a garden inspired by rock formations on an Australian beach in his design for M&G, while Mark Gregory has taken to the canals for inspiration for his Show Garden, Welcome to Yorkshire. His design consists of a towpath running alongside a canal lock (pictured). Returning to the show in 2019 is the fabulous Jardin Blanc, an innovative dining experience cooked up by award-winning chef, Raymond Blanc OBE. Reserve your table at the most exclusive eatery in all of Chelsea. Nestled in a peaceful corner of the show, you can enjoy breakfast, lunch, afternoon tea or dinner with a menu curated by Raymond Blanc. The Drawing Room is our special dining room where you can enjoy a floral-inspired afternoon tea with french pastries and warm scones alongside a flute of Champagne bubbles. More than 80 exhibitors are lining up to create dazzling displays, with many regular favourites returning to the show, including David Austin Roses, The National Association of Flower Arrangement Societies and McBean's Nursery. In 2019 you’ll be able to experience a walk-through judged garden in the Great Pavilion. The design, created by Tom Dixon and sponsored by IKEA, will be the first like it in the show’s history. The Chelsea Late is a unique opportunity to stay at the show, long after the crowds have dispersed. Indulge in botanical-inspired cocktails, relax to the sounds of cool jazz and explore the Ranelagh Gardens in a twilight setting.